These sweet and irresistible strawberry crumb bars are the perfect spring dessert! I have the most awesome spring dessert to share today! 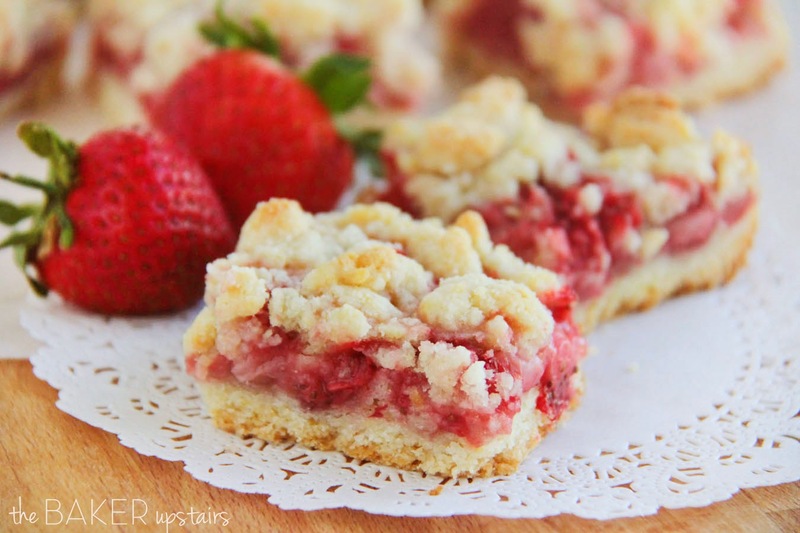 These strawberry crumb bars are to die for! I bought a case of strawberries from the food co-op last week and since then I've been using them any way I can. I've stocked up on freezer jam and I have some sliced strawberries waiting in the freezer to use for smoothies. 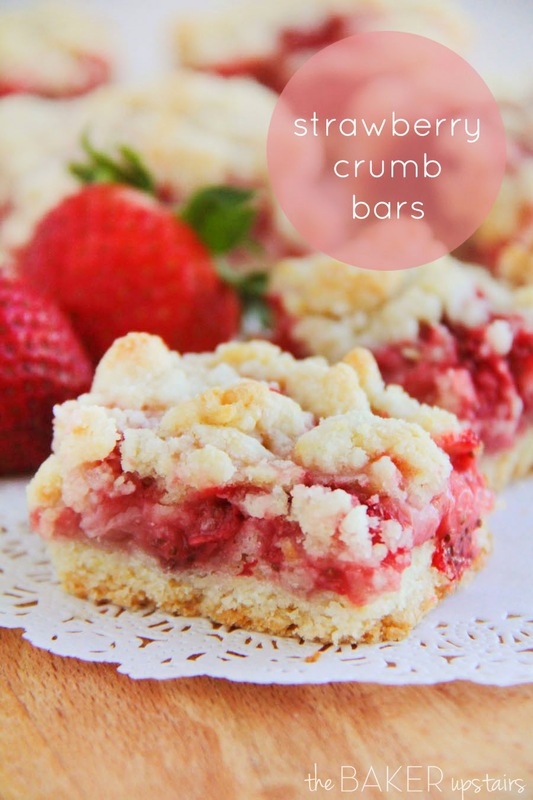 These strawberry crumb bars are my very favorite use of them so far, though! These bars are a variation on the blueberry crumb bars I posted a little while ago, and I can't decide which I actually like better. Luckily I don't have to choose. :) I love the crunchy crumb topping, the sweet fruit, and the buttery crust. These bars are so fun and perfect for this time of year! These look fantastic and I LOVE your photos!! Gorgeous! These look so yummy and summery. I'm a massive strawberry fan so I can't wit to try them! Mmm mmm mmm. These look absolutely amazing. I want one now! Mmm, they look so perfect for summer- delicious! These are soooo delicious. Easy to make and was the star of the show. The freshness of the berries really stand out beautifully. I added a tsp of vanilla to the strawberries. I do not eat eggs and simply omitted the eggs - was perfectly fine - made these bars twice. Was wondering if you do something special when washing and cutting strawberries. I washed my strawberries, dried them off and cut them up (made them pretty small). Then mixed in the sugar and corn starch, however, there then was a lot of liquid in the bowl. I scooped out only the strawberries because I thought it would be too watery if I used the whole mixture but then I sprinkled some more sugar and corn starch on top. My bars came out a fine texture but the filling was bland. Not sure if that was more because the strawberries were just okay to begin with? Any extra directions on Strawberry advice and prep would be helpful. Thanks! Hi Alicia....I want to make these bars but first I need to know if you have any extra directions on the strawberry adive and prep that Diane asked for. I sure would appreciate a reply. These look so yummy! Thanks. Nope, I prepared them exactly as written in the recipe. I don't know why there would have been extra liquid... I definitely wouldn't let the strawberries sit with the sugar for a long period of time, because that might draw out some liquid. My strawberries were firm and ripe and didn't get watery when I mixed them with the sugar and corn starch. Looks yummy! I might just have to try this recipe today! Do you store these in the refrigerator? Or room temp? Thanks! Just made a batch and they smell amazing. I like them better stored in the fridge. These are delicious! Replaced about a cup of the strawberries with some rhubarb and YUM! Never refrigerated mine and they were fine. Cut them while still warm and the office loved them. Thanks for a keeper! Can I use rhubard instead of strawberries, perhaps adding more sugar? I haven't baked with rhubarb before, so I couldn't say for sure. I've been successful with substituting pretty much any fruit in these, though, so I would guess that it would work. Let me know how it turns out! My family loved them thanks for such an amazing recipe!!! !